Dimensions 0.75 by 8.25 by 10.50 in. Amazon.com description: Product Description: A complex issue of global concern, dealing with climate change has emerged as the most defining challenge of the present, for the sustainable development of the future. Increasing emission of greenhouse gases (GHGs), rising temperature, and the resulting changes in rainfall pattern, melting glaciers, rising sea level, and extreme climatic events are having profound impacts on almost every aspect of life on earth-water, food, human settlements, health, and risks of disasters-requiring a multidimensional approach for mitigation and adaptation at all levels and in all sectors. While scientific assessments of climate risks have made tremendous advances in the recent years, there is hardly any progress in mitigating the emissions of GHGs and adapting to the impacts of climate change, as agreed in the United Nations Framework Convention on Climate Change of 1992. 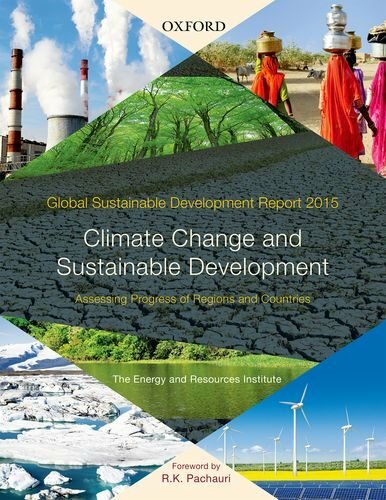 About: A complex issue of global concern, dealing with climate change has emerged as the most defining challenge of the present, for the sustainable development of the future.